Hope came down and pitched its tent, in our midst, went where we went. Hope came down for you and me, hope came down and we could see, with the longing of our hearts…Hope came down. Since the summer of 2000, when I made my first trip as a member of a short-term mission team from West Hills Church to Germany, I have been humbled to travel almost every year in this capacity. I have made three trips to Germany, two to Cameroon, two to the Czech Republic, one to North Omaha and I have also been part of the South Omaha VBS team at Iglesia el Buen Pastor four times. I have had my heart expanded in so many ways by these travels and adventures with the living Christ. I have met the family of God – our family! – in all these varied geographic locations. God knows the plans he has for us. We just need to lean into them and trust him. I have been blessed beyond abundance by these travels. I married a man who would also follow this call, Steve, who has been on many of those trips. Together we have welcomed three young German women into our home and family to experience life together as they ministered to our youth here at West Hills. We have seen a brother in Christ through the seminary in Cameroon: Joe Mbiy will be ordained this December in the Presbyterian Church in Cameroon. We have been blessed by our faithful brothers and sisters in the Czech Republic and have seen how they care for those with disabilities and addictions. We have been part of a communion service in Basrah, Iraq, where none had been held since the loss of their pastor. We have also been back to Basrah to participate in another communion service with their new pastor, a graduate of the seminary in Cairo that is supported by mission dollars from West Hills. All these journeys have been meaningful, joyful, participatory and ground for spiritual growth. But how do we give back? Coming back home this past January from Lebanon and Syria, God gave me a vision. 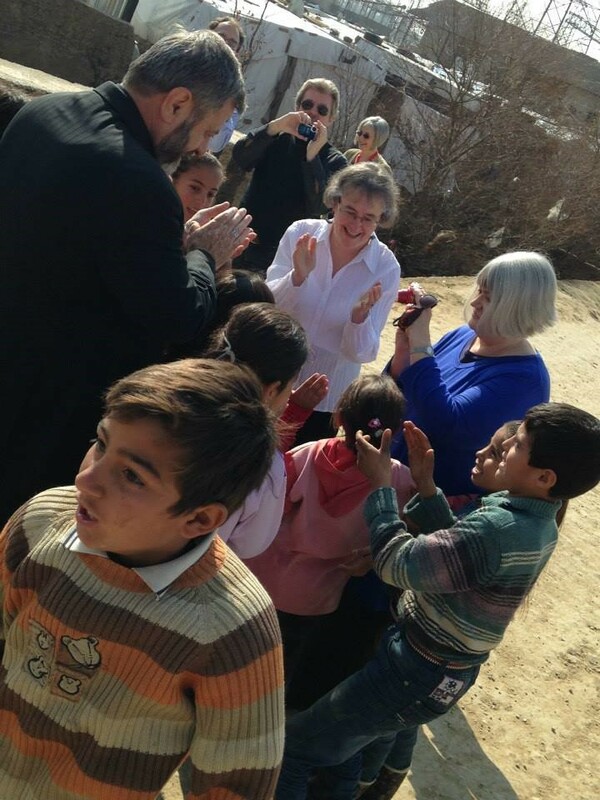 We had been to a refugee camp that hadn’t existed just eight months before in Zahle, Lebanon. It was a camp containing thousands of families who had fled from the war in Syria. It was actually one of TWO camps that hadn’t been there the year before. While in the camp, we were surrounded by the most delightful, joyful children. What did they have to be happy about? And yet they sang this song: “Yesterday we lived in a house, today we live in a tent. But tomorrow we will live in a house again.” They could see something we surely could not. The hope of a child, seeing not with their eyes, but with their hearts. And that was the beginning of this vision. The vision was to make a music video that could be shared through social media, and in the sharing people would be moved to donate to the churches who are meeting the ever-increasing needs of people fleeing from wars and losing their homes, their places of worship and their livelihoods. In this instance, you won’t have to dump a bucket of ice water on your head to take the challenge. I reached out to two very gifted people here at West Hills Church to help me with this vision. Mike Geiler (http://mikegeiler.com/) took the words of a poem I wrote and crafted a beautiful song, Hope Came Down, and then had it professionally recorded and mastered. Arlo Grafton, a master at his craft of videography, took 67 images from my trips and put them to Mike’s music. The final video is now on YouTube and I hope it is shared widely by people like you. The vision will be fulfilled when people click on the links to donate funds to projects already set up through our denomination in support of the church’s work in Syria, Iraq and in Gaza in Israel. And when I came home and looked at the pictures I saw the dear smiling faces of the clergy who were with us. The pastors in that area have visited the camps many, many times, carrying the love and the joy and the hope of Jesus into a place where he is so desperately needed. And I couldn’t help but think of the scripture I had heard so often from John 1:14, “The word was made flesh and dwelled among us,” or as Eugene Peterson puts it in The Message, “he moved into the neighborhood.” And I of course remember George phrasing it like this: “He pitched his tent with us.” His glory – his shekinah – his tent was right in the middle of ours. There it is: Hope came down. And those children were hopeful! And the passage from Hebrews 11:1, “Now faith is being sure of what you hope for, certain of what you do not see.” And those kids were singing that tomorrow they would be in their homes again. I couldn’t see it, but they could! That is a hope-filled faith and that is what I want to honor with this video. From the beginning of the church, you can discern this from some of Paul’s letters, the churches in Asia that he had started, the church in Rome even, were collecting money for the church in Jerusalem which was so oppressed. This video seems like a 21st century way to get the word out to the churches that our brothers and sisters in distant lands are suffering and they are not letting their suffering get in the way of reaching out with the love of Christ to care for those who are suffering alongside them. This video is an appeal for help! And help is so desperately needed. There are millions of refugees and internally displaced people in Lebanon, Syria, Iraq and Gaza in Israel. And that is the story. That is what happens when you follow the call to walk with the living Christ. As it says in Joel 2:28 “I will pour out my Spirit on every kind of people: Your sons will prophesy, also your daughters. Your old men will dream, your young men will see visions. I’ll even pour out my Spirit on the servants, men and women both.” (The Message) And sometimes even your old women, like me, will see visions. I have indeed. Hope came down.